To help the public in being aware in their surroundings, beacons are intentionally made to notify, warn, and attract attention to a specific location. They carry the message of the viewer while giving signals on how they should respond. Using beacons is essential to ensure the safety of people. The messages implied by colours along with the type of lights are important, so choosing the right beacon is important to ensure it is appropriate in every situation. This colour is usually associated with hazards, danger, or emergency situations. It is often seen in law enforcement such as police cars and firefighters and when combined with flashing or rotating lights, it sends a powerful signal to the viewer. Red beacons are used to warn people to stay away from an area or condition that poses a risk. This colour reminds us to be cautious, slow down, and be aware of the surroundings. Yellow or Amber beacons are commonly used to warn vehicles to move slowly in the street. It is also used for constructions sites, airport vicinity, and buildings to promote caution and awareness to people. This colour is the alternative colour for law enforcement vehicles such as EMT and firefighters. However, blue beacons are not allowed in some places like streets and highways. So if you are not sure of blue warning lights, you must consult with local officials before using them. This colour is related to safety and security. It sends a message to people that an emergency is being handled by a response team and being used on safety representatives’ vehicles and mobile command centers. And in some cases, green beacons are used by vehicles for managing funeral processions. This colour is frequently used on school buses or other forms of public transportation. Also, for some railroad companies, white beacons are used to add visibility to other vehicles. It is alternated with coloured rotating or flashing lights on vehicles. This type is the simplest form of beacon lighting. It is often a white light to clearly see what emergency workers are doing on the scene. Steady burning lights are usually incorporated with rotating or flashing lights to display emergency vehicles. This type contains a single, stationary bulb or lamp which creates rotating beams of light. A plastic dome covers the light to protect the parts of the beacon. Usually in solid colours with a rotating mirror to give a multiple flashing light effect. This type is similar to flash photography and is used in some emergency lighting. It provides an intense light due to its xenon flash lamps that improve visibility. Navigators used the beacon to help them in their destinations. Other types of beacons for navigation are radio beacons, radar reflectors, sonic and visual signals. 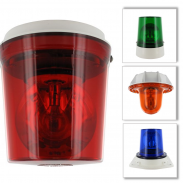 It ranges from small structures to large light stations found in water or on land. There are also unlighted beacons known as day beacons. Historically, beacons were fires lit, used for signalling over land to warn if the enemy troops were heading their way to alert defenses. It is an ancient form of the optical telegraph and part of a relay league. These kind of systems existed for so many years in different places around the world. Romans, Greeks, Scandinavians, Scottish, Spanish, and Chinese are some of the people who use beacons in their defense communications. Rotating and flashing lights are called vehicular beacons. It is affixed at the top of emergency vehicles such as fire trucks, police cars, ambulances, tow trucks, construction and snow-removal vehicles. This is used to alert the people and other vehicles in the street to be careful and make way for them. Another use of beacons is for different occasions and celebrations. Fire beacons are also an important system in the high court of Jerusalem as a way of communication for the declaration of a new month to Jews in Babylon and Israel. You might ask if the colour of the beacon really matters because, at some point, all of these are used for safety and security. But what you should know is that different colours have different meanings. Also, some of these colours are restricted to use in public places and even in law enforcement vehicles. So, it is necessary for you to know first your purpose before choosing the best colour for your application. Are Beacons a Safety Solution For The Construction Industry? Rotating Mirror Beacons – Upside Down! Sign-up to receive a monthly round-up of our latest news.